So after the success of my very first order, I had the confidence that I needed to move forward and see just where this cookie thing could take me. Valentine’s Day was coming and I was ready to go. Boy did I think that I was fancy!!! I tried banners, handwriting and quilting. I really didn’t know what I was getting into but I was looking forward to whatever was coming my way! I also had to think about packaging, which, as you can see, I didn’t know much about. 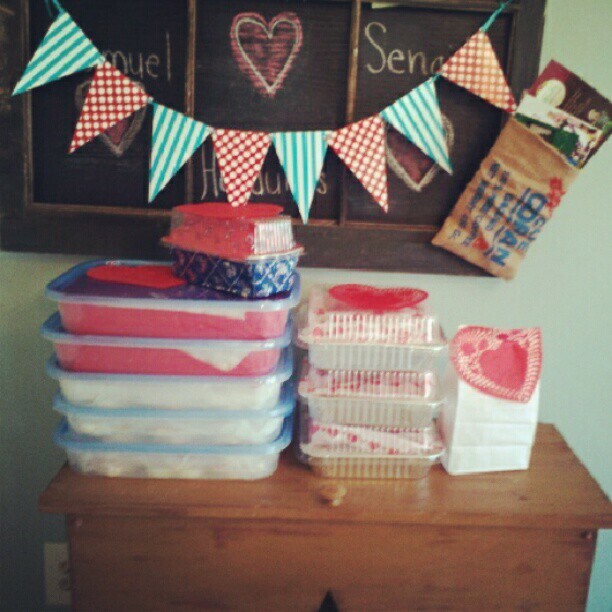 It looks like I used a combination of square aluminum pans and dollar store Tupperware. 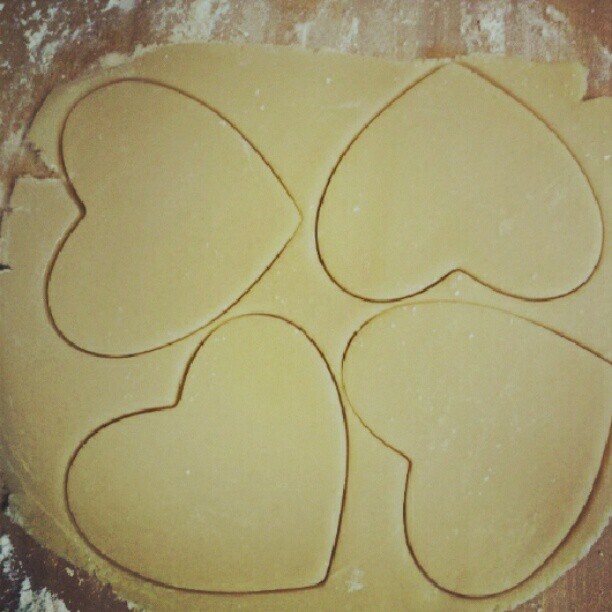 You may recognize the initial cookies from the engagement cookies that I did. I am so thankful for those friends that supported me during that first year. My expectations for this were truly just to have friends and family order for the holidays and maybe birthdays. I had no idea that this would take off the way that it did or that I would still be going into my seventh year!!! I’m so excited for what’s to come and I can’t wait to share it all with you!! It would obviously take a lot of time to share each order as they came, we’d be here for a long time, and although looking back is fun, looking forward is even more fun! So let me ask you, would you like to see more from the first year or would you rather I jump to the next big milestone that came in this cookie journey? Let me know in the comments!!! Thanks for coming along for the ride!!!! I’d be lost without you!!! So we’ve decided to take a bit of a break in the new year. Some things in our lives are shifting and we need to adjust accordingly. But since you all are super awesome and we love you, we didn’t want to leave you in the dark. We thought it would be fun to turn the clock back and take you along as we re-visit our journey from the beginning. You can follow along just on Instagram if you’d like with the pictures and short captions or come over here and sit for a bit as we share the stories behind the cookies! It should be fun and we sure do hope you’ll stick around! So here’s the story: I’ve always enjoyed baking and with five kiddos, you know Christmas Sugar Cookies were a hot mess of poorly chosen sanding sugars and sprinkles, not to mention the very generous amounts that each cookie received. Ahhhh the good ole’ days. Such fond memories, maybe it was such a mess because I was too busy watching the visions of perfectly decorated sugar cookies dancing in my head. You’ve seen them on the magazines, the perfect royal icing, Holly Jolly Santa with an actual twinkle in his eye, super cute mittens with delicate snowflakes!! Gahhhhhh I just knew I had it in me and couldn’t wait to give it a try!!! Flash forward a bit and we find a beautiful snowy day brought just that opportunity to my door!!! My children had been all bundled up in their many layers and sent outside to frolic in the snow and that’s when it hit me!!! THIS IS MY CHANCE!!! So I grabbed the magazine, all of my supplies and got to work!! It was glorious!!!! Sadly I don’t have any pictures from those early days, but as you’ll soon see, they were not very good. They didn’t look anything like the ones on the magazine cover and the “perfect royal icing” was perfectly spilling over the sides of every cookie!!!! I didn’t give up though, I started to make them for our family gatherings; Christmas, Thanksgiving, Easter, you get the point. A few years in and I had started to wonder if anyone outside of the family would be interested in in some of these cookies for their family gatherings. I shared that thought with my husband and just as I had finished I received a Facebook message from my pastors' wife and friend. 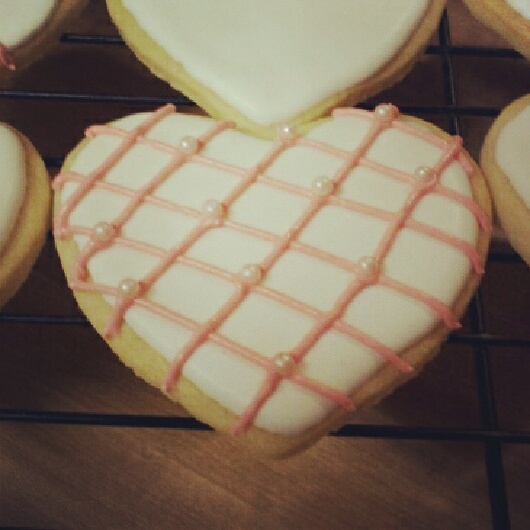 She was inquiring if I could make 5 dozen engagement sugar cookies for her son’s upcoming engagement party!! After my jaw hit the floor, I explained that I didn’t really know what I was doing but if she was sure, I was willing to give it a shot!!! Even though the request wasn’t for anything super fancy or technical I was super nervous. 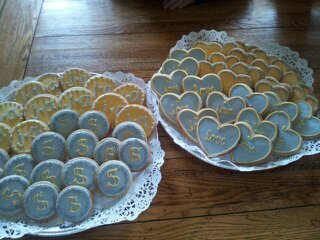 An engagement party is a pretty big deal and although the cookies weren’t a vital part of the evening, it still wasn’t something that I wanted to mess up! So there ya have it!!! 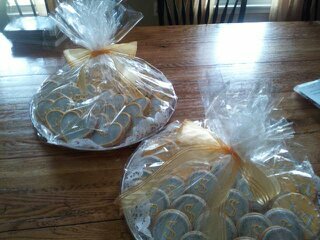 Yellow and grey/silver hearts and circles with their initials and love. I had NO idea of how to flood, I hadn’t a CLUE about consistency in my icing, didn’t have a selection of piping tips and certainly didn’t even know that Kopykake was thing!! But my friend loved them, her son and wife-to-be loved them and their friends also loved them. So I continued. I posted to Facebook in February for Valentines Day and they were a hit!! !